The Lives of the Most Excellent Painters, Sculptors, and Architects (Italian: Le Vite de' più eccellenti pittori, scultori, e architettori), also known as The Lives (Italian: Le Vite), is a series of artist biographies written by 16th-century Italian painter and architect Giorgio Vasari, which is considered "perhaps the most famous, and even today the most-read work of the older literature of art", "some of the Italian Renaissance's most influential writing on art", and "the first important book on art history". The title is often abridged to just the Vite or the Lives. 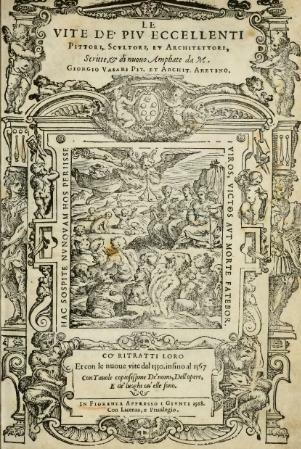 It was first published in two editions with substantial differences between them; the first in 1550 and the second in 1568 (which is the one usually translated and referred to). One important change was the increased attention paid to Venetian art in the second edition, even though Vasari has still been criticised ever since for an excessive emphasis on the art of his native Florence. As the first Italian art historian, Vasari initiated the genre of an encyclopedia of artistic biographies that continues today. 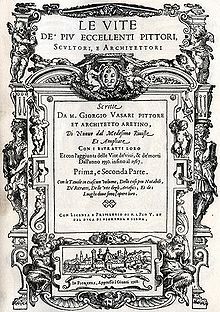 Vasari's work was first published in 1550 by Lorenzo Torrentino in Florence, and dedicated to Cosimo I de' Medici, Grand Duke of Tuscany. It included a valuable treatise on the technical methods employed in the arts. It was partly rewritten and enlarged in 1568 and provided with woodcut portraits of artists (some conjectural). The work has a consistent and notorious favour of Florentines and tends to attribute to them all the new developments in Renaissance art—for example, the invention of engraving. Venetian art in particular, let alone other parts of Europe, is systematically ignored. Between his first and second editions, Vasari visited Venice and the second edition gave more attention to Venetian art (finally including Titian) without achieving a neutral point of view. John Symonds claimed in 1899 that, "It is clear that Vasari often wrote with carelessness, confusing dates and places, and taking no pains to verify the truth of his assertions" (in regards to Vasari's life of Nicola Pisano), while acknowledging that, despite these shortcomings, it is one of the basic sources for information on the Renaissance in Italy. Vasari's biographies are interspersed with amusing gossip. Many of his anecdotes have the ring of truth, although likely inventions. Others are generic fictions, such as the tale of young Giotto painting a fly on the surface of a painting by Cimabue that the older master repeatedly tried to brush away, a genre tale that echoes anecdotes told of the Greek painter Apelles. He did not research archives for exact dates, as modern art historians do, and naturally his biographies are most dependable for the painters of his own generation and the immediately preceding one. Modern criticism—with all the new materials opened up by research—has corrected many of his traditional dates and attributions. The work is widely considered a classic even today, though it is widely agreed that it must be supplemented by modern scientific research. Vasari includes a forty-two-page sketch of his own biography at the end of his Vite, and adds further details about himself and his family in his lives of Lazzaro Vasari and Francesco de' Rossi. 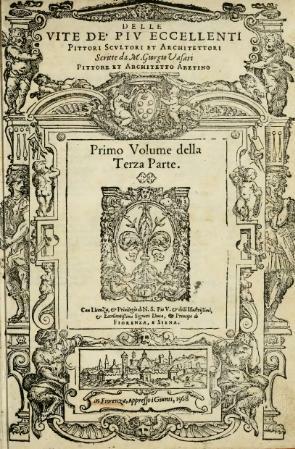 Vasari's Vite has been described as "by far the most influential single text for the history of Renaissance art" and "the most important work of Renaissance biography of artists". Its influence is situated mainly in three domains: as an example for contemporary and later biographers and art historians, as a defining factor in the view on the Renaissance and the role of Florence and Rome in it, and as a major source of information on the lives and works of early Renaissance artists from Italy. The Vite has been translated wholly or partially into many languages, including English, Dutch, German, Spanish, French and Russian. The Vite formed a model for encyclopedias of artist biographies. Different 17th century translators became artist biographers in their own country of origin and were often called the Vasari of their country. Karel Van Mander was probably the first Vasarian author with his Painting book (Het Schilderboeck, 1604), which encompassed not only the first Dutch translation of Vasari, but also the first Dutch translation of Ovid and was accompanied by a list of Italian painters who appeared on the scene after Vasari, and the first comprehensive list of biographies of painters from the Low Countries. Similarly, Joachim von Sandrart, author of Deutsche Akademie (1675), became known as the "German Vasari" and Antonio Palomino, author of An account of the lives and works of the most eminent Spanish painters, sculptors and architects (1724), became the "Spanish Vasari". In England, Aglionby's Painting Illustrated from 1685 was largely based on Vasari as well. In Florence the biographies of artists were revised and implemented in the late 17th century by Filippo Baldinucci. The Vite is also important as the basis for discussions about the development of style. It influenced the view art historians had of the Early Renaissance for a long time, placing too much emphasis on the achievements of Florentine and Roman artists while ignoring those of the rest of Italy and certainly the artists from the rest of Europe. For centuries, it has been the most important source of information on Early Renaissance Italian (and especially Tuscan) painters and the attribution of their paintings. In 1899, John Addington Symonds used the Vite as one of his basic sources for the description of artists in his seven books on the Renaissance in Italy, and nowadays it is still, despite its obvious biases and shortcomings, the basis for the biographies of many artists like Leonardo da Vinci. The Vite contains the biographies of many important Italian artists, and is also adopted as a sort of classical reference guide for their names, which are sometimes used in different ways. The following list respects the order of the book, as divided into its three parts. The book starts with a dedication to Cosimo I de' Medici and a preface, and then starts with technical and background texts about architecture, sculpture, and painting. A second preface follows, introducing the actual "Vite" in parts 2 to 5. What follows is the complete list from the second (1568) edition. In a few cases, different very short biographies were given in one section. There have been numerous editions and translations of the Lives over the years. Many have been abridgements due to the great length of the original. The most recent new English translation is by Peter and Julia Conaway Bondanella, published in the Oxford World's Classics series in 1991. Le Vite. 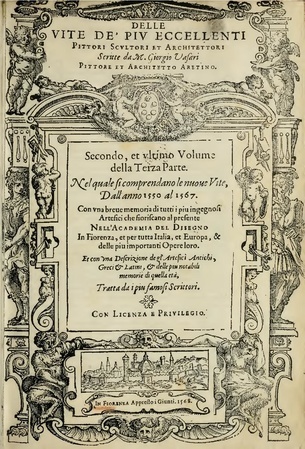 Selections of the 1550 edition (drawn from a 1768 reprint), in Italian. Stories Of The Italian Artists From Vasari. Translated by E. L. Seeley, 1908. Abridged, in English. ^ "University of Leeds website". Webprod1.leeds.ac.uk. Retrieved 5 February 2014. ^ "Christopher Witcombe, Art History and Technology". Witcombe.sbc.edu. Retrieved 5 February 2014. ^ "Takuma Ito, Studies of Western Art No. 12, July 2007". Sangensha.co.jp. Retrieved 5 February 2014. ^ "John Addington Symonds, ''Renaissance in Italy,'' 1899, Vol. 3, Part 2". Fullbooks.com. Retrieved 5 February 2014. ^ "Abstract from the transactions of the bibliographical society". Muse.jhu.edu. Retrieved 5 February 2014. ^ "Full text of John Symonds' "Renaissance in Italy"". Gutenberg.org. 13 March 2004. Retrieved 5 February 2014. ^ "Bernard Barryte, The life of Leonardo da Vinci, University of Rochester Library Bulletin (1984)". Lib.rochester.edu. Retrieved 5 February 2014. This article incorporates text from a publication now in the public domain: Chisholm, Hugh, ed. (1911). 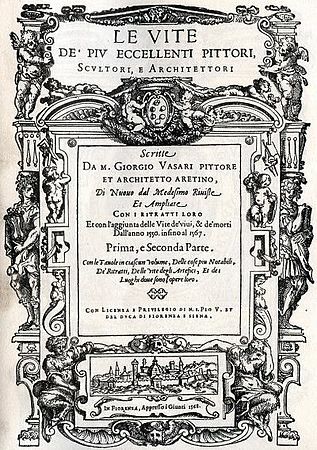 "Vasari, Giorgio" . Encyclopædia Britannica. 27 (11th ed.). Cambridge University Press. pp. 925–926. This page was last edited on 11 February 2019, at 10:06 (UTC).